If you are a Delhi bride or planning to go wedding shopping in Delhi, we have some great news for you. As always, we are trying to come up with things and advice that will make any would-be bride’s life easier. One of the greatest struggles for a bride can be finding the perfect wedding dress and we are here to help you find one with ease! We have a list of the top 25 bridal shops in Delhi where you can get your dream bridal attire for a steal! From boutique designer studios to heritage stores – we have them all! Check out these top places for bridal shopping in Delhi and thank us later! An adorable myriad of colours and exciting patterns welcome you when you step into Bhumika’s boutique. Anarkalis, bridal gowns, dresses and wedding lehengas are part of the collection and you will be spoilt for choice at this stop. Ogaan brings together several big names of the industry and presents its patrons with a wide range of designer wedding lehengas. Handwoven textiles to modern experimental designs - expect to find everything under one roof at Ogaan. Handcrafted and handwoven sarees are the speciality of Ekaya and you can never go wrong with the gorgeous drape. Ekaya also has stunning Benarasi bridal lehengas for the brides who would like to go with the trend. With an unparalleled collection of embroidered wedding lehengas and more, Asiana Couture is prepared to impress every bride-to-be. They aim to keep traditional crafts alive, they use Indian fabrics for creating their products, promoting eco-friendly fabrics and artisans. The range of Asiana Couture starts from Rs 40,000 and if you want to have the most precious one for your wedding, the price can shoot up to Rs 80,000 to Rs 5 lakhs! From zari work to gotta patti and sequined to embroidery - they have every type of lehenga you can possibly imagine! This traditional store has some of the best wedding lehengas which will easily fit into your budget. Many a brides have found their dream lehenga at Om Prakash Jawaharlal, which promises to spoil you with choice. Offering the best in ethnic wear with attractive designs, you will find the perfect pick that you were always looking for. It offers sarees, ghagras and lehengas from bridal wear to party wear. If you want to look and feel like a fashion diva, this is the best wedding lehenga shop you should head at, as it has all the latest trending designs, which you would have always desired to possess. The price ranges from Rs 10000 to Rs 75000. If you are a Bollywood fan, you are going to love this one! Anarkali Bazar has Bollywood inspired wedding lehengas which will give you major bridal goals. For the latest and trending designs, you must visit this jewel of a place in Chandni Chowk. From bridal gowns to wedding lehengas with intricate work – Frontier Raas has it all to impress every bride! You can also choose their bridal gowns for your pre and post wedding ceremonies. With multiple options and a gorgeous range of colours, Meena Bazar is a favourite among many brides-to-be. Whatever be your style, you will surely find something here that will suit your taste. Chhabra 555 offers stunning designer lehengas for brides who are looking for budget wedding lehengas. The store has an exhaustive range of bridal wear that will surely have something that you like. If you are yet to decide on exactly what you want for the big day, CTC Plaza can present you with an array of choices to help you decide. They have a diverse range of bridal wear which will surely make your job easier. Their designs and superior quality of materials appeal to every bride and you are sure to find something here that will complement your style. They have an assortment of bridal lehengas in various ranges to suit every bride. 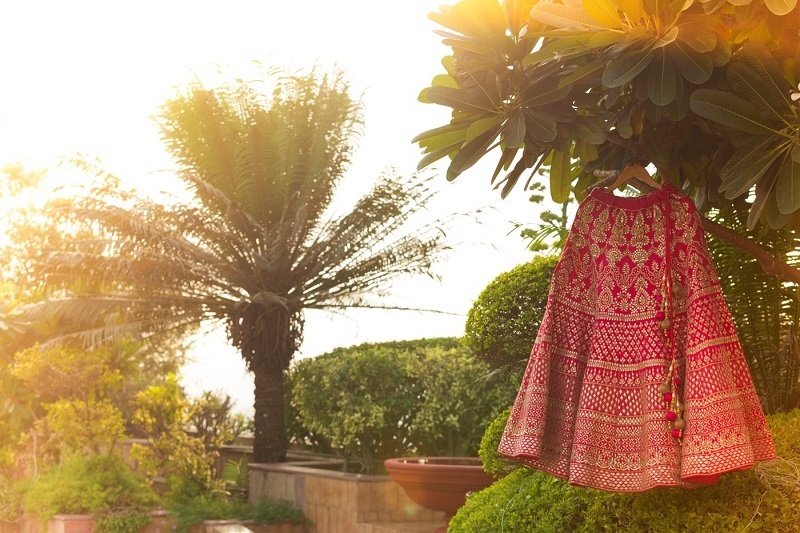 The designers at Shakuntalam lend a contemporary touch to their traditional wedding collection and make it exquisite. At Shakuntalam, you will surely find something that is unique and stunning! Established in 1993, Bombay Selections has been catering to the needs of brides all over India for over two decades. They specialize in lehengas, suits, fabrics and other essentials. One stop at the Bombay Selections and you will be all set for your big day and trousseau. If hand embroidered wedding lehengas and hand crafted textiles are your thing, you must visit the Heritage Emporium. With a wide range of hand embroidered lehengas and other attires, it is sure to impress you with its sophisticated style and timeless designs. Malhotra’s has a stunning ethnic collection of heavy bridal lehengas and sarees which will take your breath away. If you are planning a traditional wedding, you will surely find the outift of your dreams here. Ole Couture brings together 18 high-end designers under one roof and provides many options for brides-to-be. With so many designers on board, they provide every type of bridal attire - ranging from traditional sarees to contemporary gowns and lehengas. Raisons was established in 1969 and over the years has carved its name in the industry for its handcrafted textiles, rich weaves and superior designs. They fuse the traditional with the contemporary effortlessly and create something exquisite every time. At Rabhya Ethnic Couture, skilled craftsmen put in their best efforts to create attractive traditional and contemporary wedding attire. With exquisite prints and gorgeous materials, Rabhya’s creations are worthy of your big day. As the name indicates, Rasi Silks caters to most weddings with a wide variety of traditional silk sarees. If the six yard drape is not your wedding day attire, you can definitely include some in your bridal trousseau for a stunning traditional look. With multiple branches across the country, Nalli is one of the most sought after places for wedding shopping. They have been in the business for over 85 years and are considered to be one of the pioneers in the same. If not the D-day saree, you could definitely choose a few for your bridal trousseau from the experts of the six yards! Sahil Fashion Bazar has an ethereal collection of lehengas, suits and more for every occasion - from engagement to the wedding. They believe in making every occasion a special one with their gorgeous designs and include designer dresses and other essentials in their collection. This designer store has every style of wedding lehenga and is sure to spoil you for choice. They also have an attractive range of gowns, suits and other wedding shopping essentials which makes it a one stop shop for your wedding shopping. Embroidery, fabric dyeing and gorgeous designs make Gazal Gupta’s collection an exquisite one. She has a wide range of suits, wedding gowns, lehengas and dresses which will surely impress you. Ram Kishan Sarees have an attractive range of wedding lehengas and sarees which are perfect for your big day as well as the wedding trousseau. They offer beautiful budget wedding lehengas which can give designer lehengas a run for their money. These two talented designers have won over the hearts of brides all over the world and are sure to impress you with their diverse range of wedding lehengas. Attractive silhouettes and an exciting range of fabrics and designs make their collection stand apart from the rest.